« Wolves on the prowl!! Stone rock-solid, but Saints inspired!! You have to play the best to be the best, but sometimes that means absorbing a loss or two. The Whitman College women’s basketball team scrapped all night Saturday, but despite a splendid 16-point, 13-rebound effort from Coupeville grad Makana Stone, could not take down the #4 team in the country. That squad is Thomas More College, which went to the NCAA D-III Final Four last year, won a national title in 2016 and entered play Saturday with a 10-0 record. And, powered by 33 points from Madison Temple, the Saints lived up to their rep, holding off Whitman 80-63 in the final game of the Kim Evanger Raney Classic in Walla Walla. The non-conference loss snaps a four-game winning streak for the Blues, and drops them to 6-3 on the season. Stone held up well in the spotlight, leading her team in points and grabbing five more rebounds than any other player on the floor. She also played a season-high 39 of 40 minutes. For her efforts across two games (she had 25 points and five rebounds Friday against Colorado College), Stone was named to the All-Tournament team. She was joined by teammate Mady Burdett, while Temple was picked as tournament MVP. Whitman hung tough with Thomas More, leading early in the game and only trailing 15-12 at the end of the first quarter. The deficit stretched out to eight at the half, but a 21-21 third quarter stalemate kept hope alive for the Blues. It wasn’t to be, however, as the Saints proved to be strong closers, wrapping things with a 21-12 surge across the final 10 minutes. Stone, who leads her squad in scoring, rebounding and blocked shots, has 158 points, 78 rebounds, 13 assists, 14 steals and nine blocks on the year. She’s shooting 68-121 from the field and 22-30 at the line. 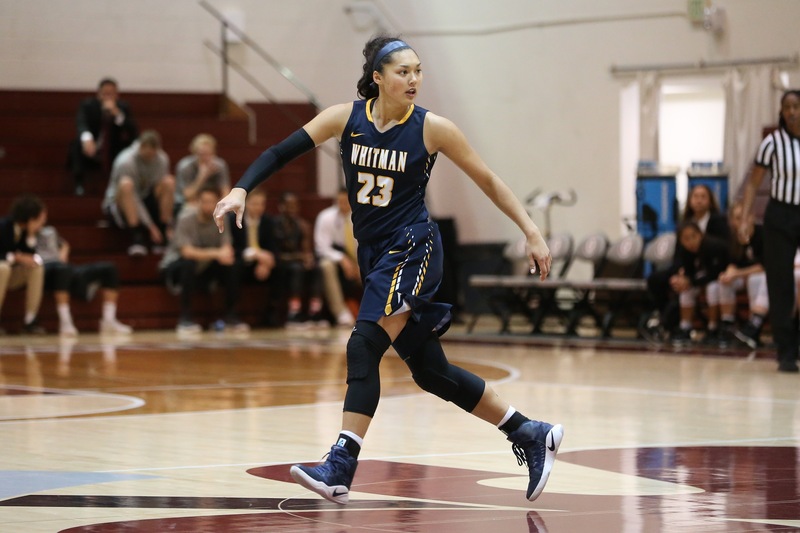 Whitman is off for a week-and-a-half, not returning to play until it travels to California for the UC Santa Cruz Classic Dec. 20-21. The Blues are scheduled to face Williams College and Northwestern at the tourney, then are off until Jan. 5, when the league season kicks into high gear.